Washington, DC - The Federal Trade Commission is mailing checks totaling $19,798,233 to drivers for Uber Technologies Inc., as part of a settlement with the Commission over allegations the ride-hailing company exaggerated the yearly and hourly income drivers could make in certain cities, and misled prospective drivers about the terms of its vehicle financing options. In its complaint, the FTC alleged, for example, that Uber falsely claimed on its website that uberX drivers’ annual median income was more than $90,000 in New York and over $74,000 in San Francisco. In fact, drivers’ annual median income in those cities was actually much lower and very few drivers—less than 10 percent—earned the yearly income Uber touted, according to the FTC. As part of a settlement with the FTC, Uber agreed to pay $20 million, which the FTC is using to send 88,799 checks to affected drivers. 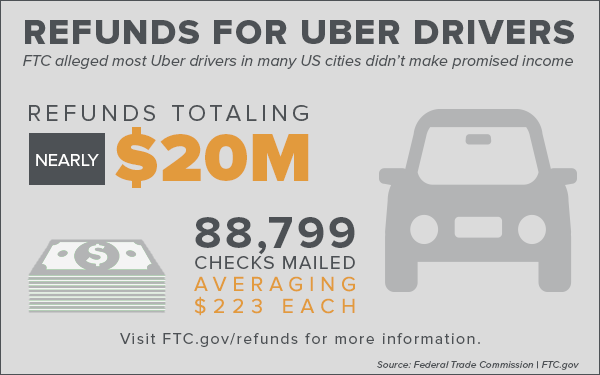 The average refund amount is $222.96, which is based on several factors, including how much recipients earned with Uber, in which cities and states they drove, and the total amount of money available in the settlement fund. Epiq, the refund administrator for this matter, will begin mailing refund checks today. The checks must be cashed within 60 days, or they will become void. The FTC never requires anyone to pay money or provide information to cash refund checks. Recipients who have questions should call 1-888-506-8281. FTC law enforcement actions led to more than $6.4 billion in refunds for consumers in a one-year period between July 2016 and June 2017. To learn more about the FTC’s refund program, visit www.ftc.gov/refunds.